Consumers’ appraisal of present-day conditions improved in October. The percentage saying business conditions are 'good' increased from 33.4 percent to 34.5 percent, while those saying business conditions are 'bad' rose marginally from 13.2% to 13.5%. Consumers’ assessment of the job market was more upbeat. The percentage of consumers stating jobs are 'plentiful' increased from 32.7% to 36.3%, while those claiming jobs are 'hard to get' decreased slightly from 18.0% to 17.5%. Consumers’ optimism about the short-term outlook also rose in October. The percentage of consumers expecting business conditions to improve over the next six months increased from 20.9% to 22.2%, while those expecting business conditions to worsen decreased from 9.6% to 6.9%. Consumers’ outlook for the job market, however, was somewhat less favorable than in September. The proportion expecting more jobs in the months ahead decreased marginally from 19.2% to 18.9%, however, those anticipating fewer jobs declined from 13.0% to 11.8 percent. Regarding their short-term income prospects, the percentage of consumers expecting an improvement decreased marginally from 20.5% to 20.3%, however, the proportion expecting a decrease declined from 8.6% to 7.4%..."
"...Consumer sentiment slipped ever so slightly in late October, despite remaining at its highest monthly level since the start of 2004. This is only the second time the Sentiment Index has been above 100.0 since the end of the record 1990's expansion, and its average during the first ten months of 2017 (96.7) has been the highest since 2000 (108.5). The October gain was reflected in more favorable consumers' assessments of current economic conditions (+4.8) as well as expected economic prospects (+6.1). Personal finances were judged near all-time record favorable levels due to gains in household incomes as well as decade highs in home and stock values. Lingering doubts about the near term strength of the national economy were dispelled as more than half of all respondents expected good times during the year ahead and anticipated the expansion to continue uninterrupted over the next five years. To be sure, consumers do not anticipate accelerating growth rates but rather a continuation of the slower pace of growth that has characterized this recovery. Low unemployment and low inflation rates have made lower income growth rates more acceptable. Moreover, the Great Recession has caused a fundamental change in assessments of economic risks, with consumers now giving greater preference to economic stability relative to economic growth. This is the essential reason why consumers have voiced such positive economic assessments of such a modest pace of economic growth. Overall, the data indicate a 2.6% growth rate in real consumption in 2017 and in the first half of 2018..."
On December 21, 2017, a "final" GDP report will be released by the BEA, which will contain the government's best estimates for Q3 2017. 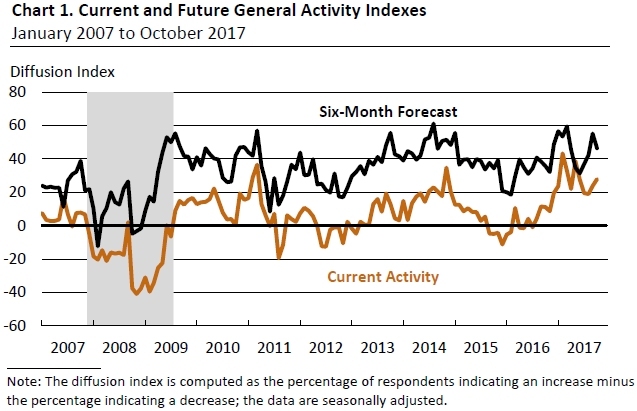 "...Claims taking procedures continue to be severely disrupted in Puerto Rico and the Virgin Islands as a result of power outages and infrastructure damage caused by Hurricanes Irma and Maria..."
Led by improvements in production-related indicators, the Chicago Fed National Activity Index (CFNAI) moved up to +0.17 in September from –0.37 in August. All four broad categories of indicators that make up the index increased from August, and three of the four categories made positive contributions to the index in September. The index’s three-month moving average, CFNAI-MA3, was unchanged at –0.16 in September..."
"...After three straight monthly declines, existing-home sales slightly reversed course in September, but ongoing supply shortages and recent hurricanes muted overall activity and caused sales to fall back on an annual basis, according to the National Association of Realtors®..."
"...'The US LEI declined slightly in September for the first time in the last twelve months, partly a result of the temporary impact of the recent hurricanes,' said Ataman Ozyildirim, Director of Business Cycles and Growth Research at The Conference Board. 'The source of weakness was concentrated in labor markets and residential construction, while the majority of the LEI components continued to contribute positively. Despite September’s decline, the trend in the US LEI remains consistent with continuing solid growth in the US economy for the second half of the year.'..." The "actual" figure above is an index of current manufacturing conditions within the Federal Reserve's Third District, which includes eastern Pennsylvania, all of Delaware and the southern half of New Jersey. Any figure below zero implies that manufacturing in the region is contracting, while a figure above zero implies expansion. Last month, the actual figure was +23.8. ...Claims taking procedures continue to be severely disrupted in Puerto Rico and the Virgin Islands as a result of power outages and infrastructure damage caused by Hurricanes Irma and Maria..."
"...Industrial production rose 0.3% in September. The rates of change for July and August were notably revised; the current estimate for July, a decrease of 0.1%, was 0.5 percentage point lower than previously reported, while the estimate for August, a decrease of 0.7%, was 0.2 percentage point higher than before. The estimates for manufacturing, mining, and utilities were each revised lower in July. The continued effects of Hurricane Harvey and, to a lesser degree, the effects of Hurricane Irma combined to hold down the growth in total production in September by 1/4 percentage point. For the third quarter as a whole, industrial production fell 1.5% at an annual rate; excluding the effects of the hurricanes, the index would have risen at least 1/2%..."
Change from Previous Month: -2.184%. "...The NFIB Index of Small Business Optimism tumbled in September from 105.3 to 103 led by a steep drop in sales expectations, not just in hurricane-affected states, but across the country. The number of small business owners who expected better sales plunged a net 12 points last month. Owners who think that it’s a good time to expand dropped a net 10 points. Also within the Index, expected better business conditions (-6) and capital expenditure plans (-5) retreated in September. 'The drop-off was consistent around the country regardless of region, and it’s likely that members in Florida and Texas were underrepresented in this survey because of the obvious disruptions,' said NFIB Chief Economist Bill Dunkelberg. 'The adjusted average employment change per firm dipped to -0.17, which is a significant drop in hiring activity. 'The Index remains very high by historical standards,' he continued. 'Small business owners still expect policy changes from Washington on health care and taxes, and while they don’t know what those changes will look like, they expect them to be an improvement. But the frothy expectations they’ve had in the previous few months clearly slipped in September.'..." The previous month's Small Business Optimism Index was 105.3. "...In September, average hourly earnings for all employees on private nonfarm payrolls rose by 12 cents to $26.55 [+0.454%]. Over the past 12 months, average hourly earnings have increased by 74 cents, or 2.9%. In September, average hourly earnings of private-sector production and nonsupervisory employees increased by 9 cents to $22.23 [+0.407%]. The previous month's PMI reading was 58.8%. "...Economic activity in the manufacturing sector expanded in September, and the overall economy grew for the 100th consecutive month, say the nation's supply executives in the latest Manufacturing ISM® Report On Business®..."
"Hurricanes causing supply chain and pricing issues." "Business levels continue [to be] strong; usually by now, a seasonal downturn begins." "Energy sector (oil and gas) continues to be strong. Price of oil appears to be beginning to stabilize." "We’ve had a very good year and we are forecasting continued strong demand for our product in 2018." "Business is strong. However, we are concerned about price increases due to the hurricanes." "We are closely watching the Houston events as many of our production chemicals are produced in the Gulf region. Some tightening of supply and/or price increases expected." "Labor shortages continue to haunt operational capacity both at [the] local plant [level] and up and down the supply chain." "Hurricanes Harvey and Irma will have significant effects on input costs. Disruption in supply chain. Concerns of transportation." "Hurricane Harvey, and now Irma, have impacted the business (building materials). Increasing sales but also causing significant price increases on input raw materials. "Lumber prices starting to drop, and log prices starting to increase. Not the best combination.